Harry Potter will soon be in Orlando. Harry Potter soon to be flying over Orlando. If you have shared the books, watched the movies, and have been waiting to vacation with Harry, Hermione, and Ron then this news will be great. The much anticipated debut of Harry Potter in Orlando is officially on the calendar. 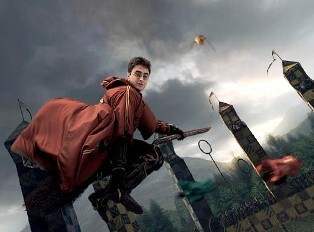 The Wizarding World at Universal in Orlando will open its door on June 18, 2010. It seems like Wizarding World should be in the U.K. where there’s a better chance of a few chills and fog but let’s make the best of it. Our family has shared the Potter trail from the first book to the last movie. I have made my share of rock cakes, chocolate frogs, ton-tongue toffee, and cockroach clusters. We have plodded to movie sites in England and listened to the original wizard rockers Harry and the Potters. The books resulted in hours of conversations, debates, and speculations. The movies meant as entertainment provided entertainment and more discussions. We never found Platform 9 ¾. Nor did we hitch a ride on the elusive knight bus even though we did find the street. We sipped coffee in Edinburgh at the magical Elephant House, the spot where Harry was born. Where else can you find haggis, neeps and tatties (Scotland’s national dish) on the menu next to pesto, mozzarella and olive paninis? I’m going there this summer! So excited! The only weird thing is that it won’t be cold while we’re in Harry Potter world. Haha. Gotta love Florida though!